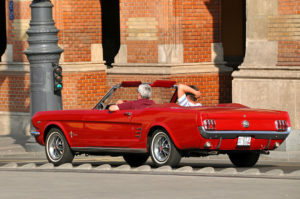 In the 1960s there was a class of cars introduced to the world known as muscle cars. These cars were sleek and sporty and contained a powerful engine. Most of these cars boasted a V8 engine which was geared for speed. As these cars were produced the manufacturers were in stiff competition with each other. As each manufacturer tried to out do the other, we were led into an era of some of the fastest cars of our time. With no thought to gas and fuel efficiency, Americans seemed to be having the time of their lives. Their cars were fast and eye-catching, both on the road and on the race track. Racing stripes and flashy decals made a statement about both the car and the driver. It seemed the flashier the car the more desirable. At a time when the luxury automobile was the king of the road for the married set, the younger crowd wanted something smaller, faster, and sportier. The Shelby Mustang and the 440 Roadrunner are two of the fast cars which were built to satisfy the desire for high performance and speed. There were many more fast cars to come. Camaros, Chargers, GTOs, and Firebirds all tried to pack as much punch under the hood as was possible. Corvettes offered speed and sleek style, but they also had a high price tag. Most of the other high performance cars offered a price that was affordable to the average working class people. During the 1960s and 70s auto manufacturers were riding high on a wave of speed and performance. Then we entered an era where we were told gas was in short supply and we were destroying the ozone with our extravagant auto emissions. We reluctantly let go of our fast and sporty cars and took to the streets with a V6 and even a V4. Gas mileage and cheaper insurance costs forced the fast cars onto the race track and off the roadways. The desire for speed will be with us always. We will probably never again see a time when speed and high performance engines are sold for the every day street car but we can get a glimpse of these cars at the raceway or at vintage car shows. The baby boomers were around to see these cars at their inception and they still carry a torch for them today. Many will spend a small fortune to restore one of these original fast cars back to their former splendor. Gavin Drake is a self confessed “Petrol Head” and loves fast cars. He races in a number of championships in the U.K and runs http://www.fastcarsinfo.com where fellow petrol heads can come chat, share photo’s and catch up on the latest automotive news.